Before leaving the subject of clocks, I wanted to include a photo of this one, sent to me by Ian Dixon. It’s not the type I’ve included on earlier pages, which were all street clocks or factory clocks. This too is a factory clock, but it lived inside, and once controlled factory time at the glassworks in York (Redfearn National Glass, pictured below, and previously mentioned on this page). Ian would be interested in hearing from anyone who remembers the clock in the factory. If you do, please add a comment below. Located near the works fitters workshop, it was used to set the time for the whole building, wired up to all the clocking-in clocks and clock dials, so factory time was controlled from one place. An easy and accurate way of controlling time in factories as it meant only one clock to worry about (and change twice a year when the clocks go forward/back an hour). Apparently it was rescued from the factory when it closed, by a man from Acomb, who had it in storage until a couple of years ago. Ian has serviced it and replaced worn parts and restored it. It’s now on his living room wall. Ian notes that the clock isn’t particularly valuable, but it is ‘a nice piece of history’. He intends to fit a small plaque inside it showing the factory dates. 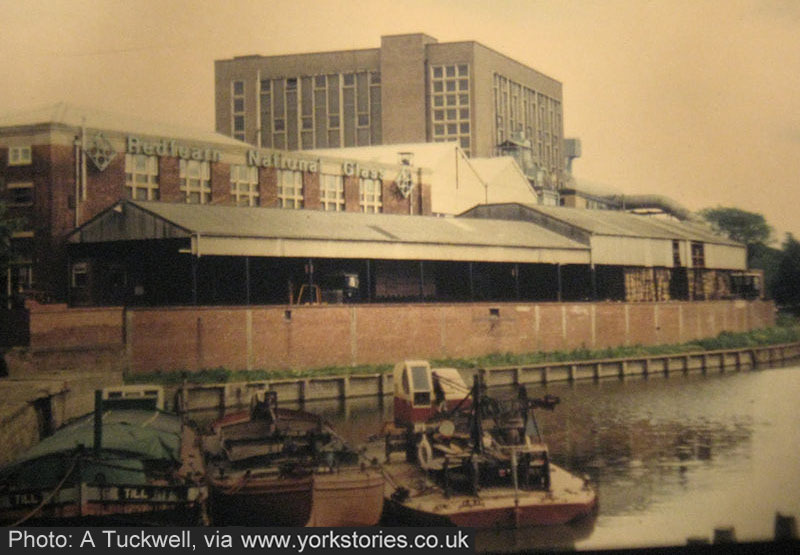 Andy Tuckwell’s photo of the factory dates from 1977. It closed the following decade. We tend to call it just ‘the glassworks’, but it was Redfearn National Glass from 1967 to 1984. Redfearn was founded in September 1967 from National Glass Works (York) Ltd (founded in 1930) & Redfearn Bros, Barnsley. A glassworks had been on or near the site since the 18th century, my rather rushed Googled research suggests. The factory buildings were demolished in the late 1980s. A hotel now occupies the site. See the earlier page for Andy’s memories of working here for a short time in the late 1970s. Thanks to Ian for the photo and information. I worked at the glassworks as a shift instrument mechanic from 1978 to 1981. (My father, Alwyn Sutcliffe was a fitter there from 1958 to closure). I can remember changing the time on this clock (it was the master for the clocking machines and was in the time office) in spring and autumn when the clocks changed. Thanks Barry, nice to read this, and I’ve emailed Ian to let him know. Yes I was told it came out of the timekeepers office and it was acquired by a fitter when the factory closed who stored it away until a couple of years ago it came to light again when he was packing his house up to emigrate and it was listed on ebay locally that’s when I acquired it and was told of its redfearn connection and I started my hunt for information about it. It will never be a valuable clock but it can be rich in history. Thanks again and all the best Ian Dixon. I worked there from 1978 to 1980 as a process trainee. Probably 2 of the happiest working years of my life – short but very sweet, it was one huge family. Does anyone recall the day the glassworks chimney was demolished? From what I’ve read above, it must have been in 1984, or soon after. I can’t have been much older than twelve but my memories are quite sharp. It was demolished on a Sunday morning and the weather was awful: a constant, heavy, clammy rain. Undeterred, a group of us hardy souls had gathered in (I think) St George’s Field to watch the chimney’s demise. My dad and I – along with perhaps 15 to 20 others – were quickly soaked to the skin as we waited hour after endless hour, as no-one seemed to know when the crucial moment was due to arrive. We owned an incredibly cheap, slim-line, fixed-lens camera that, looking back, was woefully insufficient for the job. Nevertheless, I distinctly remember we were confident of capturing the perfect image of the chimney, midway through its collapse at precisely 45 degrees, as it sailed towards the ground. As it was, my dad had it tucked inside his coat to keep it dry. As a deafening hooter suddenly shattered the rainy morning to signal the detonation of the charges, his desperate fumbling failed to produce the camera until long after the chimney had very much returned to earth. If anyone managed a better job than us and snapped a picture of the chimney tumbling earthwards, I’d love to see it! I worked at National Glass from about 1960 to 1974 when I left to go to live in New Zealand. Initially I worked for Mike Johnson, in Mould Design and later moved across into Product Development working with David Anderson for Mr H.W.Williamson, Marketing Director. Our job was to create new shapes and designs for National’s clients such as Nestle, General Foods, Unilever, etc. It was an interesting job, going to meet these clients and see round their factories. When National merged with Redfern’s I was given the responsibility for upgrading all of Redfern’s bottle specifications and converting all specs to metric. This took many months of work and in some cases much redrawing of olds specs. I devised a new method hanging and storing all these specs into specially designed cabinets, which greatly decreased the time looking for the drawings. Along with this system I designed a computer-like card system to sort and find relevant designs by, weight, capacity, size and client. Again this proved to save time when searching for comparable bottles in a range. I really enjoyed my time working for Redfern-National Glass but was offered a good job in Product Development with AHI Glass, New Zealand, who flew me and my family out to NZ and provided accomodation for 2 weeks in a motel.